Being somewhat of a late adopter, a couple of weeks ago I finally signed up for a music streaming service that, lo and behold, gives me access to just about all the music I could ever hope to listen to. What I've quickly learned is that I am more of an albums guy than a playlist guy. Also, I don't like to shuffle songs but prefer to listen to an album in the order the artist/producer intended. Most interesting, at least for me, was to see where I ended up after a mad flurry of searching and saving, i.e., which musicians and albums formed the core of my jazz listening pleasure. When I started this blog about eight years ago, I began profiling some of my favorite jazz albums from different artists that ultimately comprised an idiosyncratic Top 50. It wasn't meant to be a definitive or comprehensive list; my choices often depended on what I was listening to that week. It included some unsung musicians (so to speak) while omitting more seminal ones. I also included only one album per artist even though there were often multiple albums in an artist's oeuvre that deserved greater attention. Below, I've taken a different tack, having started from scratch with practically the entire universe of mainstream jazz recordings. These are the roughly 100 albums I decided to save/download to build the foundation of my new virtual jazz library. In some instances I've eschewed the more familiar, arguably superior, recordings of a given musician and gone instead with some of their less renown work. Oh, and I've also included Frank Sinatra even though he isn't technically a jazz musician because, well, he's Frank Sinatra. 1) John Coltrane. The Atlantic Studio Recordings (including Bags & Trane (1959), Giant Steps (1960), Plays the Blues (1960), Ole Coltrane (1961), My Favorite Things (1961), Coltrane Jazz (1961), and Coltrane's Sound (1964)). 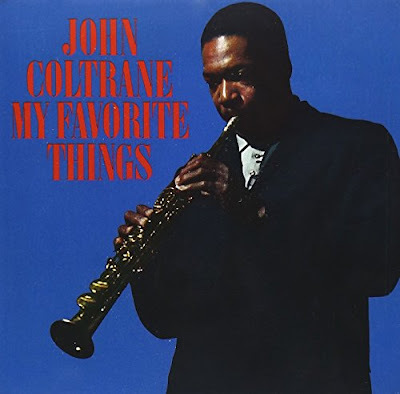 It is unfathomable how brilliant and prolific Coltrane was during this brief period, with many of these albums recorded at the same sessions in late 1960. I added three earlier gems: Blue Train from 1957 and two from 1958, Lush Life and Soultrane. And, of course, Love Supreme (1965). To make this an even dozen, there's the wonderful album he did with vocalist Johnny Hartman (1963). I could quit now and have a pretty satisfying jazz library. 2) Art Pepper. My two favorite albums from my favorite alto saxophone player are Meet the Rhythm Section (1957), which featured the rhythm section for Miles Davis' first quintet, and Plus Eleven (1959). Pepper made three more stellar albums in 1960 (Gettin' Together, Smack Up, and Intensity) before his career was waylaid by drug addiction and incarceration. He did make a remarkably fruitful comeback that began in the 1970s as reflected in The Complete Galaxy Recordings. 3) Horace Silver. The ultimate standard for funky hard bop piano, pretty much any Horace Silver album over the ten-year span from 1955 to 1965 is worth hearing over and over again. The classics are: Horace Silver and the Jazz Messengers (1955), 6 Pieces of Silver (1956), The Horace Silver Trio (1957), Blowin' the Blues Away (1959) and, of course, Song for My Father (1965), one of the greatest albums of all time. 4) Bill Evans. Obviously, we must start with the incomparable Village Vanguard recordings from 1961 with his first great trio. And then to less trod ground: Moonbeams (1962), At Shelly's Manne-Hole (1963), and then The Best of Bill Evans Live on Verve. There's nothing quite like hearing a Bill Evans album for the first time -- even some of his well worn classics sound different because he never plays them the same way twice. Revelations for me include Bill Evans at Town Hall (1966) and, particularly, California Here I Come (1967). 5) Sonny Clark. Sonny Clark Trio (1957), Cool Struttin' (1958) and Leapin' and Lopin' (1961). One can't go wrong with Sonny Clark, another of the great hard bop piano players. These three albums and all of the others he made in his way-too-short life (he died at the age of 31 in 1963) are absolutely essential. The others include: Dial "S" for Sonny (1957) with Art Farmer on trumpet and Hank Mobley on tenor, Sonny's Crib (1957) with Coltrane (shortly before he recorded Blue Train), Donald Byrd on trumpet and Curtis Fuller on trombone, and My Conception (1959) with Byrd and Mobley. 6) Miles Davis. I'm particularly partial to Miles' first quintet (Coltrane on tenor, Red Garland on piano, Paul Chambers on bass, Philly Joe Jones on drums), which recorded four remarkable albums in 1956: Workin', Relaxin', Steamin' and Cookin'. Two more favorites: Bag's Groove (1954) and Walking (1957). 7) Sonny Rollins. Sonny Rollins Plus Four (1956), with the four including the great Clifford Brown on trumpet and Max Roach on drums, Way Out West (1957), and The Sound of Sonny (1957) featuring another Sonny, Sonny Clark, on piano. Also, The Bridge (1962), recorded after a three-year lay off, featuring guitarist Jim Hall, and two spectacular albums from 1956, Saxophone Colossus and Tenor Madness, the latter with Coltrane joining Sonny on the title track. 8) Stan Getz. I absolutely love his bossa nova albums. Even though they are pretty well worn, they never sound tired to me: Getz/Gilberto and Getz/Gilberto #2 (1964). Getz was also remarkable in a non-Latin setting, see, e.g., Stan Getz and The Oscar Peterson Trio (1957) and Stan Getz and J.J. Johnson at the Opera House (1957). 9) Thelonious Monk. Thelonious Monk Quartet with John Coltrane at Carnegie Hall, recorded in 1957, but only recently discovered. Two other favorites of mine are Monk Plays Ellington (1955) and The Thelonious Monk Orchestra Plays Town Hall (1959), with Monk's tunes in an orchestral setting. 10) Cannonball Adderley. Somethin' Else (1958) with Miles Davis sitting in, is a true classic, as is Mercy, Mercy, Mercy at the It Club (1966). So much other great stuff in between, including Things Are Getting Better (1958) with Milt Jackson on vibes and The Cannonball Adderley Quintet in San Francisco (1959). 11) Chet Baker. Chet Baker Sings (1956) and Chet Baker Plays and Sings (1964). The world is divided into those who love Chet's voice and those who love his trumpet playing. Nothing wrong with his blowing, but I'm partial to the singing. 12) Yusef Lateef. I didn't really discover this singular artist until his passing a couple of years ago. Eastern Sounds (1961) and Live at Pep's Volumes I and II (1964). 13) Art Blakey and the Jazz Messengers. So many amazing incarnations with so many musicians who became legends in their own right -- and who are, not surprisingly, overly represented on this list. Moanin' (1958) with Bobby Timmons on piano, Benny Golson on tenor, Lee Morgan on trumpet; The Big Beat (1960), with Wayne Shorter replacing Golson on tenor; Mosaic (1961) and Caravan (1962) with Freddie Hubbard on trumpet, Shorter on tenor and Cedar Walton on piano. (And don't forget the original band with Horace Silver, Hank Mobley on tenor and Kenny Dorham on trumpet listed above). 14) Speaking of Hank Mobley, the great tenor saxophonist's most well known album is Soul Station (1960) (with Wynton Kelly on piano, Paul Chambers on bass and Art Blakey on drums). Other worthy additions: Roll Call (1960) (Kelly, Chambers, Blakey and Freddie Hubbard on trumpet) and Dippin' (1965)(Lee Morgan on trumpet). Another gem that fits well here is a date led by the great pianist Kenny Drew, Undercurrent (1960), which features Mobley and Hubbard. 15) Kenny Dorham, another Blakey alumnus, made some classic albums, including Quiet Kenny (1959) and Whistle Stop (1961). I came across another fantastic recording that I had somehow never heard before, Afro-Cuban (1955), which includes Mobley, Blakey, Horace Silver, with J.J. Johnson on trombone and Cecil Payne on baritone sax. 16) Lee Morgan, yet one more Jazz Messenger, was an absolutely brilliant trumpet player, probably most known for his funky cross-over hits like The Sidewinder and Cornbread, but he could play anything, from hard bop to ballads to stuff that is a bit more out there, all of which he did with a stellar lineup of musicians. The Sidewinder (1963) features Joe Henderson on sax and Barry Harris on piano; Search for the New Land (1964) with Wayne Shorter on tenor, Herbie Hancock on piano and Grant Green on guitar; Cornbread (1965) with Mobley on tenor, Jackie McLean on alto and Hancock on piano; and The Gigolo (1965) with Shorter on sax and Harold Mabern on piano. 17) Wayne Shorter. The great saxophonist and composer who played in one of the Jazz Messengers' greatest lineups and in Miles Davis's second great quintet. Adams Apple (1966)(with Herbie Hancock on piano) and, of course, Speak No Evil (1966)(with Herbie Hancock, Freddie Hubbard, Ron Carter on bass and Elvin Jones on drums) one of the greatest albums of all time. 18) Donald Byrd -- one last Jazz Messenger who is well represented above, made some great albums with baritone saxophonist Pepper Adams, including Off the the Races (1958), Byrd in Hand (1959) and The Cat Walk (1961) and Chant (1961). 19) Barry Harris has been playing bebop piano since the mid-1950s, and is still going. Two of his finest are Newer Than New (1961) and Barry Harris Plays Tadd Dameron (1975). 20) Dexter Gordon deserves to be in the pantheon of all time great tenor saxophone players. I particularly love his Blue Note recordings from the early 1960s. He had an incredible run with Doin' Allright (1961), Dexter Calling (1961), A Swingin' Affair (1962), Go (1962), and Our Man in Paris (1963). 21) McCoy Tyner. Can't get enough of McCoy's piano genius from the Coltrane sides and other albums listed above, so I've added Live at Newport (1963) and The Real McCoy (1967), and a compilation, The Impulse Story (2006). 22) Oliver Nelson's The Blues and the Abstract Truth (1961) is another of the greatest jazz albums of all time, with an all time lineup: Bill Evans on piano, Freddie Hubbard on trumpet, Eric Dolphy on alto, Paul Chambers on bass and Roy Haynes on drums, along with Nelson on tenor. 23) Meet the Jazztet (1960), led by Art Farmer (trumpet) and Benny Golson (tenor), with McCoy Tyner on piano and Curtis Fuller on trombone. Worth it just for Killer Joe. 24) Any serious jazz collection should have Charlie Parker. For my virtual library, the Parker album I listen to the most is actually Charlie Parker with Strings, recorded in 1950 but released in expanded form in 1995. 25) Same goes for Clifford Brown, the phenomenal trumpet player whose life was cut short at the age of 25 when he was killed in a car accident in 1956. The Emarcy Master Takes are a great place to start. 26) The more traditional route: Count Basie, The Complete Atomic Basie (1957). And some Duke Ellington albums -- Ellington Uptown (1957), Duke Ellington Meets Coleman Hawkins (1962), and And His Mother Called Him Bill (1968). 29) Can't forget the vocalists: Dinah Washington, Dinah Jams (1954) with an extraordinary band, including Clifford Brown, Harold Land and Max Roach; Sarah Vaughan (1954), also featuring Clifford Brown and In the Land of HiFi (1955), featuring Cannonball Adderley; Ella Fitzgerald, Rogers and Hart Songbook (1957) and the Jerome Kern Songbook (1964), but any of the Songbook albums will due; Anita O'Day, Anita Sings the Most with the Oscar Peterson Quartet (1957) and Pick Yourself Up (1957); and Johnny Hartman, I Just Dropped By to Say Hello (1963), from the same year he recorded his classic album with John Coltrane, listed above -- this one includes Illinois Jacquet on sax and Hank Jones on piano. 30) And last, but not least, the man and his music: Frank Sinatra. Don't judge me. In the Wee Small Hours (1955), Songs for Swingin' Lovers (1956), A Swingin' Affair (1957) and, of course, Sinatra at The Sands (1966) with Count Basie.